When we think of the "fathers of flight," we immediately picture the Wright Brothers. But they weren't the first to bear that title. Few technologies have had such a big impact on our culture as air travel. Before the age of aviation, few could afford to visit foreign shores. Surface transport was expensive, slow, and uncomfortable. The vast distances which separated the nations meant made aliens of our neighbours. Since commercial flight has become a reality, the world’s horizons have shrunk. Tourism has grown to be a major source of income and employment. And business and culture have spread beyond national borders. When we look back to the dawn of aviation, we can trace these sweeping changes back to a few pioneers. When we think of the “fathers of flight,” we immediately picture the Wright Brothers. But they weren’t the first to bear that title. Otto Lilienthal was. 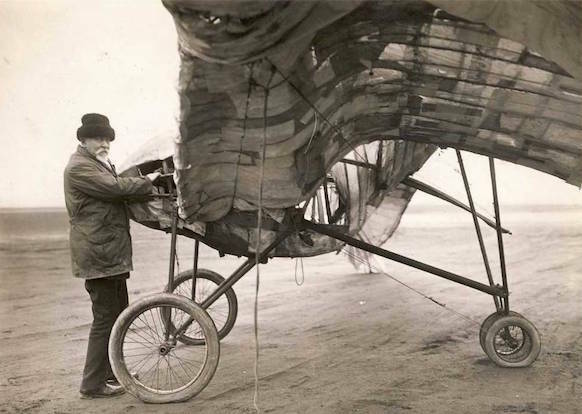 Although he never successfully flew a powered plane, he was the first to build and fly winged aircraft. His gliders are the ancestors of today’s airplanes and gliders. And his research on the flight mechanics of birds forms the basis of modern wing design. The Wright brothers named Lilienthal as their inspiration. Photographs of his gliding experiments were reproduced and published all over the world. At the time when he made his first successful flights, Orville and Wilbur were selling bicycles. The photos inspired them to build their own craft, which eventually led to the first successful powered airplanes. The Wright Brothers weren’t the only pioneers to rise to the challenge, either. A number of inventors were similarly inspired, and the race to build the first self-propelling plane was on. Like many who were drawn to flight in the early days, Otto’s passion for flight began as a child. Born in 1848, he was spellbound by the tales of Count Zambeccay. The count was an aeronaut, and his ballooning adventures made a lasting impression on Otto and his brother Gustav. Together, they dreamed of flying. They were also inspired by an animal fable. In the story, a stork tells a wren how he is able to fly so far without getting tired. The brothers were captivated by the detailed description of gliding. They realized that the same principles could be applied to a manned craft. Many mothers would shudder at the thought of their sons trying to fly with homemade contraptions, but their mother was surprisingly supportive of their enthusiasm. She realized they had a driving passion, and would probably do it anyway. As long as they ran their plans by her, and took the right precautions, she was happy to give them her blessing. Their uncle was less supportive. He thought their ideas were crazy at best, and treated them to his dire predictions and ominous warnings. Undeterred, the boys continued with their plans. Their early results were far from successful. While still at school, they built a pair of wooden wings which strapped on to their arms. They planned to fly by jumping from a hill and flapping their arms like birds. Of course, they didn’t want to be seen by their school friends, so they conducted their experiments in the still of the night. Their second attempt was based on a similar concept. This time, they added a great many feathers to the wings. Having learned that it’s not a good idea to jump from a height with an unproven flying machine, they carried out their early experiments in the attic of their family home. Once again, the experiments were a failure. But they didn’t give up. Over the next few years, they built a couple of models. The first prototype was spring powered, and could fly across 2 rooms by flapping its wings. Their experiments were interrupted by the outbreak of the Franco-Prussian war. Otto volunteered to serve his country and took part in the siege of Paris. He was later remembered by his old war chums as an eccentric with a dream that one day men would fly. The next model he created was steam powered, with a tubular engine of Otto’s own design. It turned out to be too powerful for the small model, breaking the wings. It was a success for the motor, but a failure for the aircraft. He realized that he could buy the time he needed with a successful invention. So he invented a machine to help miners move coal rapidly from the mines. Unfortunately, the coal market was in a slump at the time. The invention was useful, but few mines could afford to buy it. And so Otto returned to the drawing board. It’s around this time that he met Agnes Fischer, during a trip to Saxony. They were drawn together by a mutual love of music. Otto played the French horn, and she played the piano. They married in 1878, and would have 4 children together. Down on his luck, Gustav moved into their house. The brothers worked on another invention, a brick toy for children called the “anchor.” Although it proved popular with the children who played with it, it was a commercial failure. Gustav was unable to make ends meet as an architect in Prussia, so he emigrated to Australia. Otto’s next invention was based on the tubular steam engine he had created for his flying model. This invention was a success. 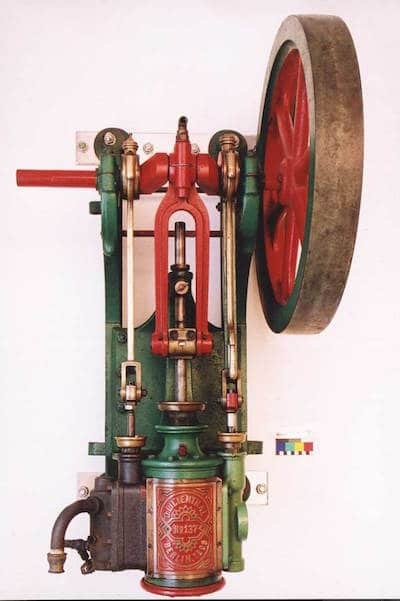 It was a considerable improvement over existing steam engines, delivering more power and operating more safely. Otto was soon able to retire on the income from his tubular engine. While his results have been improved on since, his work still forms the foundation of modern aviation. Gustav was thriving in Australia, but he returned to continue his experiments with his brother. Together, they built the first of several working gliders. 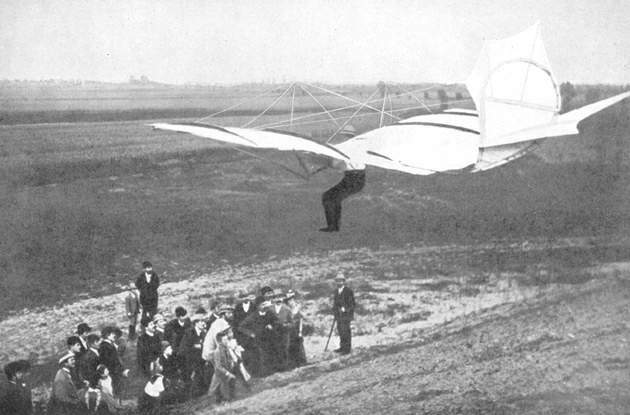 Otto flew the Derwitzer Glider for the first time in Brandenburg, in 1891. The glider was an extension of his earlier “strap-on wing” plans and had a total wingspan of just over 7 metres. It flew over a distance of 25 metres. It was a stunning achievement, and the world took notice. The experiments were well documented and photographed, and news quickly spread. Scientific journals and the popular press were both intrigued. Otto continued to improve his designs. Over a period of 5 years, he built and tested 20 different craft, including biplanes. He knew there were several problems that had to be solved to make flight a viable mode of transport. First, there was the problem of power. Then there was stability – his gliders were prone to diving uncontrollably in poor conditions. Then there was the matter of control. He was convinced that planes should be powered by a flapping motion of the wings. He saw the flight mechanics of birds as the ideal model. Nature had provided a simple, effective and economical design for air propulsion. At first, he thought the pilot could provide the power directly, by flapping the wings using the arms. When he realized that this wouldn’t work, he tried several different motor designs to solve the problem. These ranged from a variation of his tubular steam engine to a chemical engine. He made better progress in the area of stability. He introduced a hinged tailplane which compensated for the tendency to dive. And his biplane designs improved general stability considerably. Steering was a more serious problem. His craft was steered by shifting the pilot’s body weight to change the attitude of the wings. It was effective, but it was limited by the way the pilot was harnessed to the glider. Unlike modern hangliders and microlight aircraft, Lilienthal’s gliders were attached to the pilot’s shoulders. This meant he couldn’t shift his weight very far from the craft’s center of gravity. Nonetheless, he did manage to improve the steerability of his glider using a handbar. A similar design is used in hangliders today. Otto made a great deal of progress in the 5 years since his first flight. He performed over 2000 flights in his gliders and had spent a total of 5 hours in the air. Inventors all over the world were taking notice, and he had a fair number of imitators. But his progress was terminated prematurely by a fatal accident. On 9 August 1896, he took his “Normal Glider” out to perform several experimental flights. It was a fine day, sunny but not too hot. His first 3 flights were successful, and he managed to fly 250 metres on the 3rd flight. During his 4th flight, the glider pitched into a dive. He was unable to pull the nose up, and he crashed into the ground from 15 metres. He broke his neck. His mechanic rushed him to the local physician who identified the injury. Knowing that he lacked the skill to treat such a terrible fracture, he rushed Otto by train to the clinic of Dr. Ernst von Bergmann. Bergmann was one of Europe’s most renowned surgeons, but he was unable to treat Lilienthal’s injuries. He died a few hours later. He left behind a widow and four children. Gustav never gave up on the idea of a plane powered by flapping wings. He continued to improve on his brother’s designs until his death in the 1930s. By this time, propeller power was a thoroughly accepted concept. Aeronautic engineers who looked beyond the propeller dreamt of jet propulsion and rocket engines. Flapping wings were considered a naive dead end, and Gustav’s craft never flew. 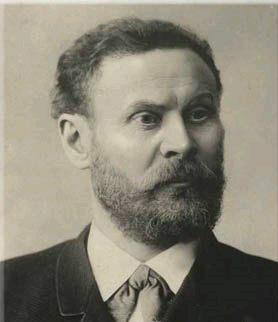 Otto Lilienthal’s life was dedicated to a simple dream. In chasing that dream, he paid the ultimate price. He wasn’t the first to sacrifice his life in the name of flight, and he wasn’t the last. At the time, critics were not slow to spot the similarities between his fate and that of Icarus. But was that a fair comparison? In legend, Icarus succumbed to pride and flew too close to the sun. His selfishness was his undoing. Otto did put his passion for flight before his safety and the wellbeing of his family, but his motives were far from selfish. Lilienthal wasn’t a giddy-headed amateur who leapt into danger without thinking. His flights were careful experiments. His findings were thoroughly documented and meticulously tabulated. Shortly after his fatal crash, the Wright Brothers began their own experiments with gliders. His research formed the basis of their early experiments. Their own innovations were based on his discoveries. They refined the equations that he published in his book using their own experimental data. They solved the problem of control with their concept of wing warping, and later ailerons. And, in December 1903, they made the first powered flight. The Wright Brothers were very open about the influence Otto’s work had on their own achievements. 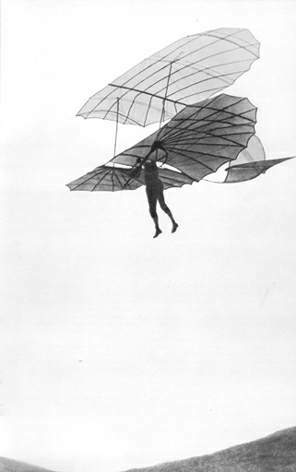 Wilbur publicly stated that Otto Lilienthal’s research was the most important aviation work of the 19th century. And Orville visited Lilienthal’s widow to pay his respects in 1909. He told her that her husband’s influence on aviation was responsible for the work he undertook with his brother. Today we live in a world that has been shaped by aviation. Commercial air travel has shrunk the horizons and expanded our prospects. It fuels our economies and stimulates cultural exchange. Air travel is safe. But early aircraft were very dangerous. It took a lot of trial and error to make safe flight a reality. This progress was bought dearly with the lives of pioneering aviators, including Otto Lilienthal. From the busiest cities to the most remote pockets of civilization, we all benefit from modern aviation. Today, when natural disasters strike, it’s air transport that brings medical aid and relief workers to repair the devastation. Through the dedication and hard work of inventors and pioneers, our culture has been transformed. Along the way, sacrifices were made.